What vegetarian doesn’t have a dog-eared, food-stained copy of the Moosewood Cookbook in her cookbook stack? I’m also a fan of best-selling, award-winning author Mollie Katzen‘s cookbooks for kids: Pretend Soup, Honest Pretzels, and Salad People. So I was pleased to hear that the warm and whimsical writer has penned a guide to getting started in the kitchen called, aptly enough, Get Cooking: 150 Simple Recipes to Get You Started in the Kitchen. Folks are eating up a steady diet of food blogs and food films. Talk about takeout, new restaurants, street eats, food produce and products permeates everyday conversations. What’s missing in all this chatter? The art and craft of cooking. So, calling all wannabe cooks: This is the book for you (or the wannabe cook in your life, or perhaps even the person you want to be a wannabe cook). Lots of non-intimidating ideas to get the kitchen newbie — or even a seasoned home cook — going, with sound advice about recipe reading, basic gear, and knife skills. The author covers simple soups, salads, main meals, sides, and desserts designed to expand a beginner’s repertoire. And her “get creative” sidebars offer loads of options for playing with the basic recipe. I particularly like the sound of Roasted Butternut Squash and Apple Soup, Wilted Spinach Salad with Hazelnuts, Goat Cheese, and Golden Raisins, Chickpea and Mango Curry, and Cherry Clafoutis. One quibble: The photos don’t do the food justice; they’re a bit bland and lifeless. They’re not the kind of food shots we’re accustomed to seeing in cookbooks, food sites, or glossy mags. Perhaps the author was going for authenticity over visual excitement. (I attended a food photography session where folks were advised to use fake cream over the real thing ’cause it looks better in a photo. Oh my.) Regardless, Katzen’s enthusiasm and passion for food shines through on the page. Read a review. Visit the get cooking website. Check out sample recipes, such as Vegetable-Tofu Stir-Fry with Orange-Ginger Glaze. To win a copy of Get Cooking leave a comment below about what skill, technique, or dish you’d like to learn. Entries must be received by Friday, March 5, PST by 10 pm. Winner chosen at random. Update: Wow! Mollie Katzen is clearly onto something. It seems like loads of folks want to get cooking, judging by the response to this giveaway, my most popular to date. The copy of Get Cooking, chosen at random, goes to Karen Pochodowicz. 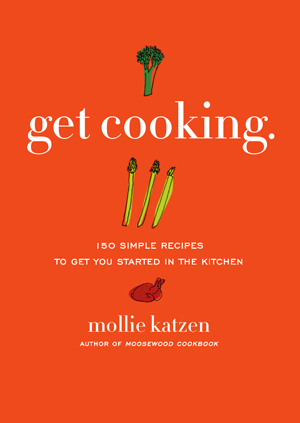 But wait — for all you budding chefs who want to learn knife skills, take a look at Mollie’s video tutorial and find sample recipes from the book here. And check back later this month for my March book giveaway. i want to learn how to make bread! I do love the Moosewood Cookbook. I just made the eggplant parm the other weekend, and it was so good. I’d like to try the Easier-Than-You-Think Twice-Cooked Broccoli dish on Mollie Katzen’s site for her new cookbook. Thank you so much! I’d just love to learn how to make biscuits! Mine always turn out like rocks! I would love any simple healthy week-night meals to put together quickly and take leftovers for lunch! I would like to learn a better technique for removing the pits from stone fruits. I have never tried to make homemade bread, and so I would like to learn how to do that. For some reason, the idea of working with yeast, punching down dough, letting it rise, etc. really intimidates me. I’d love to try her Greek Pizza. Thanks. I would like to learn the Chilled Herbed Spinach-Potato Soup with Buttermilk. I’m pretty good in the kitchen for everyday things, but I’d like to know how to make a really great pie crust because the few times I’ve tried it’s been a disaster. I would like to learn how to braise. I would love to win. Thank you for this great giveaway. I need better knife skills because I’ve tried holding my knuckles back and lifting and pressing the blade down but it makes a mess. I’d like to learn how to make Fettuccine Alfredo. I would like to learn how to make a great souffle. I would like to learn to bake homemade bread. I am a huge Mollie Katzen soup fan! I must learn to all of her soup recipes! I have always wanted to learn how to make a great split pea soup. Previous post: What's Cooking at Berkeley's Kitchen?